When Matt Cook was diagnosed with osteosarcoma, a rare bone cancer, he was just 18 years old. His experience, the unique challenges he went through as a young adult fighting cancer, inspired the foundation that bears his name. At such a young age, Matt faced thirty-one rounds of chemotherapy and near-annual surgeries. He faced frustration, fear and loneliness as an in-patient at Edmonton’s Cross Cancer Institute. He faced pain and discomfort. When cancer took his leg, he gave up a promising hockey career. Life will present challenges: you can either lay down or you can fight. Matt was a fighter. He committed himself to serving the community, and to inspiring others to pursue their dreams. Matt became a Certified Mentor with the Canadian Cancer Society, a Certified Peer Visitor for the Canadian Coalition of Amputees and a Leader Trainer for the youth version of the Stanford Chronic Disease Self-Management Program. He was Honorary Chair for the 2008 Edmonton Relay for Life and the inaugural Face Off Against Cancer tournament in 2009. He supported programs such as Soldier On—which provides resources to ill and injured Canadian Forces members—and he became a member of the Alberta Amputee Sport and Recreation Association. Matt played Bantam and Midget AAA with the Canadian Athletic Club, and Junior A with the Bonnyville Pontiacs. 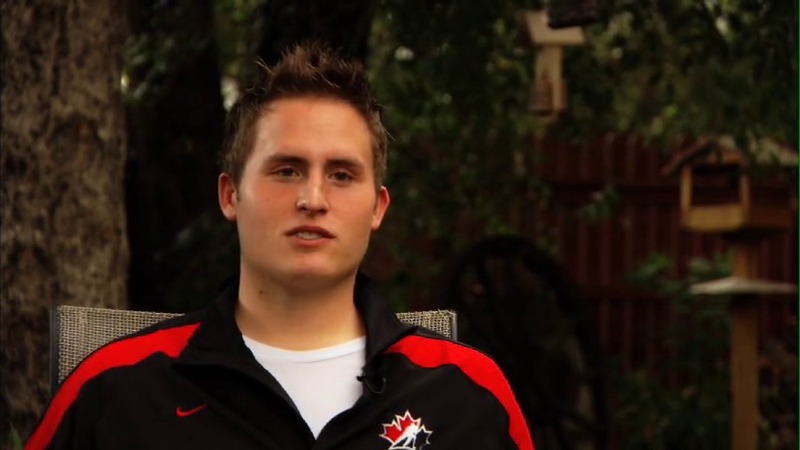 When he lost his leg, he took up sledge hockey and trained with conviction until he made the Canadian national team. He helped Canada win bronze at the 2009 World Championships in Ostrava, Czech Republic. Even after he learned his cancer was terminal, he attended Olympic training camp and planned to compete in the Vancouver 2010 Paralympics. Unfortunately, his health began to decline. The cancer was progressing too quickly and he couldn’t go. Matt Cook passed away April 4, 2010, in Edmonton. We take inspiration from Matt’s life because nothing could stop him: he always found a way. He faced diagnosis after diagnosis, treatment after treatment, with courage, tenacity, and pride. Matt wanted to be the best person he could be, to achieve his goals and be of service to others. The Matt Cook Foundation provides comfort to people who are fighting cancer so that, through his legacy, he can continue to make a difference.